Thomas William Marwick, farmer, was born in York, Western Australia on 19 April 1895, the son of Warren Marwick, a farmer and member of the Western Australian Legislative Council, and Susan, née Collins. Thomas was educated at Christian Brothers College, York, and then at the Perth Technical School where he studied engineering. On leaving school in 1911 Marwick worked for two years in the Brookton and York districts, before taking up wheat and sheep farming in Greenhills. In July 1916 he enlisted in the AIF but in September was discharged as medically unfit. Marwick took an active part in the affairs of the district and was associated with several sporting bodies. He served as a director of the York Co-operative Company and was a member (and chairman) of the York Road Board. For many years he played an active role in the Primary Producers’ Association (PPA), representing the York District Council on the PPA’s wheat executive. In 1932 the PPA was ‘sectionalised’ in order to better represent particular farming interests, and in the same year a political section was formed on which Marwick served as one of three joint vice-presidents from 1935 to 1936. He later became vice-president of the Country and Democratic League (in effect the Country Party), created in 1944 following the political section’s complete separation from the PPA. 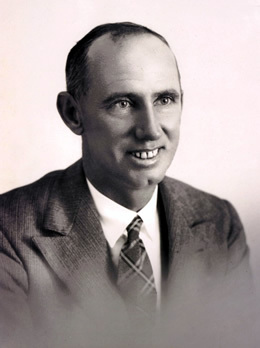 On 19 August 1936 Marwick was chosen at a joint sitting of both houses of the Western Australian Parliament to fill a casual vacancy caused by the death of Senator William Carroll, Marwick winning by five votes over the ALP candidate, R. F. Bourke. A quiet, retiring man, Marwick prided himself that he, unlike ALP senators, was not under Caucus control. His strong advocacy of states’ rights manifested itself in two strands of thinking, the interests of Western Australian primary producers, many of whom were affected by drought, grasshoppers and the like, and the need for his state to be treated fairly by the Commonwealth. Marwick’s political philosophy lay in his belief that Australia’s prosperity rested on that of the farming community. During debate on the Financial Relief Bill (No. 2) 1936 he protested against the exclusion of the wheat industry from participation in the fertiliser subsidy. He spoke in favour of some measure of federal government control of primary products during debate on the Constitution Alteration (Marketing) Bill 1936. (The proposed amendment of section 92 of the Constitution, defeated at the subsequent referendum, would have removed restraints on the Commonwealth with respect to marketing.) On another occasion he proposed that it would assist primary producers if, for taxation purposes, their income assessment was averaged over three years. In the same speech he pointed to the failure of Australia’s financial institutions to adequately support rural interests. The Western Australia Grant Bill 1936 caused Marwick to challenge the impartiality of the Commonwealth Grants Commission in respect of its proposed financial assistance to Western Australia. He moved an amendment that the bill be redrafted to include a special grant to his state of £800 000. Like so many Western Australians of the time, he based his case on the principle that certain states had been disadvantaged by Federation, and that this had been recognised when the commission was appointed. He repeated this criticism in 1937, when he expressed the hope that commission personnel would be changed. By contrast, Marwick supported the Inter-State Commission Bill 1937, believing that an interstate commission would enjoy security of tenure, unlike the Commonwealth Grants Commission, which was appointed annually. He put forward the view that an interstate commission should be in a position to take into account the disabilities experienced by Western Australia as a consequence of its vast area, relatively small population and distance from Australia’s main population centres. He believed the Commonwealth had a special obligation to assist in the development of Western Australia. To redress his concern about the treatment of the less populous states within the Federation, Marwick supported a proposal for a convention to review the Constitution. In debate on the Acts Interpretation Bill 1937, he stressed the importance of the Parliament over the executive. Marwick also took exception to tardy attendance by senators: ‘Some penalty should be imposed on a man who absents himself without leave’. He hoped, ‘in fairness to the taxpayers’, that Senator Walter Massy-Greene, who had erred in this respect, would attend or ‘tender his resignation’. Marwick was defeated at the general election of 23 October 1937. Thus, under existing electoral legislation, his term in the Senate concluded at the date of the election and not at the expiration of Carroll’s vacancy on 30 June 1938. In September 1940 he tried again for a place in the federal Parliament, this time for the House of Representatives seat of Swan. He lost, but shortly after, on 21 December, won the seat at a by-election, holding it until July 1943 when, standing as an Independent Country Party candidate, he was defeated. While an MHR, he continued to speak out for Western Australian interests, especially on the wheat industry and the effects of war on the community. In 1941 he expressed his grief that ‘in my own State at least 17 per cent of the wheat-growers have abandoned their farms’. He served on the Joint Committee on Profits from July 1941 until July 1943. He was also appointed to the Joint Committee on Rural Industries in September 1942. Marwick, a man dedicated to the service of the rural community and his state, retired from farming, and largely from public life, some ten years before his death, which occurred on 3 April 1960 at St John of God Hospital, Subiaco. After a Requiem Mass at the Immaculate Heart of Mary Church, Scarborough, he was buried at Karrakatta Cemetery. On 28 July 1920, Marwick had married Lilian Isabel McInerney, of Greenhills, in St Mary’s Roman Catholic Cathedral in Perth. There were no children of the marriage, but Marwick seems to have been part of a devoted circle of family and friends. Leading Personalities of Western Australia, Paterson Brokensha, Perth, 1950, p. 257; F. R. Mercer (comp. ), On Farmers’ Service: A Short History of Farmers’ Organisation in Western Australia, Farmers’ Union of WA, Perth, 1955, pp. 20, 33, 36, 47–8; West Australian (Perth), 20 Aug. 1936, p. 18. CPD, 18 Sept. 1936, pp. 302–3, 18 Nov. 1936, pp. 1952–3, 8 Sept. 1937, pp. 716–19. CPD, 9 Oct. 1936, pp. 968–70, 1 Sept. 1937, pp. 361–4, 11 Nov. 1936, pp. 1639–40. CPD, 24 June 1937, pp. 336–7, 25 June 1937, pp. 438–9, 1 Sept. 1937, pp. 361–4, 25 Aug. 1937, pp. 65, 77, 9 Sept. 1937, pp. 835–6. CPD, 6 Mar. 1942, pp. 277–9, 25 June 1941, p. 389, 2 July 1941, p. 689, 6 Nov. 1941, p. 129, 1 Oct. 1942, pp. 1313–14, 19 June 1941, p. 176; CPP, Joint Committee on Profits, reports, 1941, 1942; West Australian (Perth), 5 Apr. 1960, p. 40. This biography was first published in The Biographical Dictionary of the Australian Senate, vol. 2, 1929-1962, Melbourne University Press, Carlton, Vic., 2004, pp. 49-51.